Innovation in the area of planetary science is driven by the demanding environments in which spacecraft and their instruments must work, by the large datasets and challenging observations that must be made to understand planetary systems, and by the sheer curiosity of humans as a species to understand their own world in relation to the others we have found and are finding. This WP provides the key scientific backbone of EPN2020 and focuses on the human resources of the project itself and beyond - on researchers and engineers working in the field of planetary exploration in the ERA, contributing to overall capacity building in Europe. Our ambition is to integrate and network the providers of planetary science infrastructures with the users and with the wider European Planetary Science community and European Industrial partners. The activities will contribute to broaden international S&T cooperation as well. There will be 25 WS-type activities over the 4 years of the project. integrate and network the providers of planetary science infrastructures with the users and with the wider European Planetary Science community and European Industrial partners. activities will also contribute to broaden international S&T cooperation as well. link the Europlanet2020 RI with other Horizon 2020 activities. 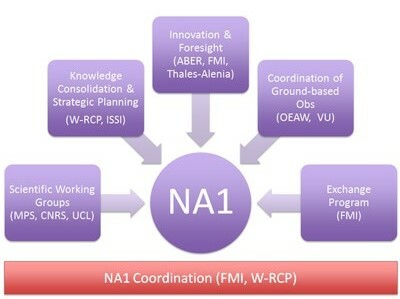 As an advanced infrastructure, a key objective will be widening participation of the 13 ?new? EU members, Portugal, Luxembourg, and some associated countries. Two major and five normal WS will be organised in Inclusiveness States. Two of current task leads are from these countries and they will also be included in all WS organising committees. Another new objective is the inclusion of industrial partners, e.g. from EUROSPACE, to develop new technology applicable in future space missions, providing a significant impact both for science and technology. Industrial partners will be included in all activities and as well as in the Exchange programme. The Exchange program facilitates short term visits and exchange of personnel and hosts workshops. Each Task of the WP focuses on a special aspect of the WP. An integrated system of workshops, team meetings, and personnel exchanges will be established to improve the scientific and innovation impact of the infrastructure, and focus on important future strategic issues. A minimum 20% of the participants will be young scientists and we plan to organise tutorial-type WSs for the next generation.The knowledge consolidation and foresight activity will identify key science issues and produce integrated reference books on major science themes that will ?bridge-the-gap? between the results of present/past missions and the scientific preparation of future ones. Part of the working group activities will be devoted to integrate participants of other tasks; this WP will organise WS for the TA/VA WPs and their JRAs. Widening participation of the 13 ?new? EU members (IMS). Two major and five normal WS will be organisedin Inclusiveness States. The inclusion of industrial partners, e.g. from EUROSPACE, to develop new technology applicable in future space missions, Industrial partners will be included in all activities and as well as in the Exchange programme. The Exchange program facilitates short term visits and exchange of personnel and hosts workshops. An integrated system of workshops, team meetings, and personnel exchanges will be established to improve the scientific and innovation impact of the infrastructure, and focus on important future strategic issues. A minimum 20% of the participants will be young scientists and we plan to organisetutorial-type WSs for the next generation. The knowledge consolidation and foresight activity will identify key science issues and produce integrated reference books on major science themes that will ?bridge-the-gap? between the results of present/past missions and the scientific preparation of future ones. Part of the working group activities will be devoted to integrate participants of other tasks; this WP will organise WS for the TA/VA WPs and their JRAs. 8.3.2019 NA1 Exchange Program has been closed. All visits must be done by the end of June 2019 and reimbursemet claims by the end of July 2019. Late reimbursement claims will not be handled. 9.1.2019 New deadlines for Open Call for NA1 Exchange Program. Applications can be submitted any time until 28.2.2019 and period of the exchange visit is until 30.6.2019. 7.5.2018 The Exchange program now also supports early-career scientists participation to workshops arranged by Europlanet. The program can reimburse travel expenses and accommodation. The list of upcoming workshops is on NA1 website. If you cannot see tweets, click here.